The people who point out that we already have investor-state dispute settlement provisions in other trade deals and ‘so far so good, we haven’t had to worry about them’ …man, that is such an absurd argument. When it comes to arms reduction and nuclear proliferation, do we say ‘Hey, we haven’t had World War III yet, so its OK to keep on building the bombs and spreading them around?’ No, we aim to restrict the prevalence of the weapons, we don’t make them easier to use, and we don’t try to claim that they ‘protect’ us. Meaning: the fears about the ISDS provisions in the Trans Pacific Partnership deal are well-founded. The reality is that there is a sharp uptick in the occurrence of ISDS litigation in developed countries, and even the right wing likes of The Economist have been souring on the process for some time. If you wanted to convince the public that international trade agreements are a way to let multinational companies get rich at the expense of ordinary people, this is what you would do: give foreign firms a special right to apply to a secretive tribunal of highly paid corporate lawyers for compensation whenever a government passes a law to, say, discourage smoking, protect the environment or prevent a nuclear catastrophe. Countries with highly developed legal and constitutional systems – such as Canada – are regularly on the receiving end of ISDS litigation, with the Bilcon case being a classic example. In Canada, cases such as Bilcon go to heart of the ability of governments to govern in the public interest. Why, in fact, do investors need ISDS mechanisms? Given that New Zealand has a well developed and efficient legal system, why can’t foreign investors take their chances in our local courts? That’s a fair question. As the Economist also points out, countries around the world are backing off from ISDS and asking foreign corporates to respect the integrity of local courts to deliver them just remedies for compensation – and not rely on some stacked panel of corporate hired guns sitting in a room in Geneva. The ISDS mechanisms have outlived their original purpose – which was to protect firms from illegal expropriation by rogue dictators – and have mutated into a tool by which multinationals seek to limit the freedom of sovereign governments. So much for the TPP being a high quality deal for the 21st century. In reality, the TPP is a deal for the robber barons of the 19th century, and their modern ilk. The other common TPP canard is that hey, since a (razor slim) majority of parties in Parliament are in favour of this deal, everyone should go home because the process is entirely democratic. Well, no. We do not have an elected dictatorship in this country whereby majoritarian rule can do whatever it likes and retroactively claim a mandate for its actions. Such a Parliament can indeed ram through laws, but it will do so only by debasing the currency of government, which requires transparency and consultation and some prior process of rational debate. Democracy, in other words, is a two way street. The public will respect laws passed by law-makers who show a basic level of respect for the public. Nothing like such a process has occurred with the TPP. That’s why there is so much anger about it. Significant freedoms fought for by previous generations have been signed away, secretively. Even the deal’s proponents tend to lament the lack of transparency shown during the TPP process. Is the TPP worth it? Misleading claims are being made about the extent of the benefits that the TPP will bring to this country – as if the deal was all sunny upside and as if any opposition to the deal can be attributed only to some irrational, atavistic hostility to ‘free’ trade. Yet even if the MFAT claims of a TPP-fuelled 1 % growth in GDP by 2030 and gains of X hundreds of millions in export volumes were true – and they’re highly dubious – such gains would be less than what a few points off the exchange rate would deliver. Meanwhile, as the Tufts University research has shown, the kind of economic models relied on by MFAT officials explicitly ignore – as their starting points – the competitive race to the bottom among members countries that the TPP will generate, and all of the related cuts to wages, job destruction and rise in income inequality that will come in the TPP’s wake. Really, the strongest arguments against the TPP are the economic ones. The final outrage is that the Key government has chosen to sign away sovereign rights – whether it be via ISDS provisions or over IP patents, copyright terms etc etc – on the eve of the Treaty of Waitangi celebrations, and at the SkyCity casino in Auckland, which is the site of another of this government’s dubious deals. This piling up of provocations cannot be accidental. Quite cynically, the Key government appears to have chosen to deliberately link opposition to the TPP with Maori radicalism. Instead of an informed debate on the TPP on its merits, Key is calculating that far more political capital can be won in the heartland by inflaming the issue, and playing the race card on the TPP. Divide and rule. Tomorrow, it will be up to the TPP protesters to stand together in opposition to this kind of deal, and this kind of politics. Finally…for some time now, Sharon Murdoch has been the best and sharpest political cartoonist in the country. 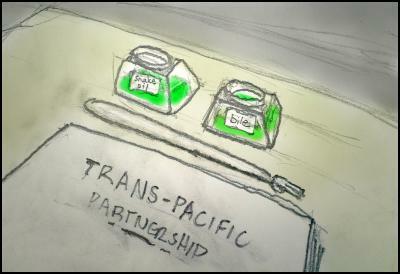 On the eve of the Treaty commemoration, her brilliant cartoon on the Treaty/TPP issue say it all. Phew. So we, and Donald Trump, now know that Trump can’t shoot someone on the street and still get away with it. In Iowa, Trump shot only himself – in the foot – by taking victory for granted. Fair enough. When Ben Carson had briefly surged ahead of him in the Iowa polls last year, Trump responded: “How stupid are the people of Iowa?” Not a good way of endearing himself, and while attending church last Sunday in a belated attempt to woo evangelicals, Trump still couldn’t get it right. Reportedly, he mistook the communion plate for the collection plate, and reached for his wallet. Not smart in a state that (see below) takes its religion seriously. If he skips the [Fox News] debate and ends up losing Iowa, he will look like a tactical fool who made the most boneheaded, avoidable error of the cycle. The impression that he has it all figured out, experts be damned, will begin to crack. Crack it now has. And it is hard NOT to regard the Fox debate boycott – which was motivated by Trump’s petty feud with Fox news anchor Megyn Kelly – as the last straw. Marco Rubio picked up most of the late breaking votes (he surged eight points beyond even his last score in the final Des Moines Register poll) after shining on a Thursday night debate stage that was blessedly free of Trump, who had been sucking up all the available political oxygen. But there’s more. According to entrance polling, some 64% of those who voted in the Iowa Republican caucuses (a) identified themselves as evangelicals and also (b) identified “voting for someone who shares my values” as being the main issue guiding their vote. Significantly, only 5% of them thought Trump shared their values, as opposed to the 43% who thought Ted Cruz did, and the 21 % who felt the same about Rubio. To Iowans, The Candidate For Change from New York City clearly wasn’t seen to be one of them. To them, “change” itself wasn’t an issue. Social conservatism was, and Cruz was seen to be their God fearin’ guy. Trump will be more at home – and more akin – to the secular voters of New Hampshire next Tuesday. However, his aura of invincibility has now gone for good. And after New Hampshire – where Bernie Sanders’ likely victory on the Democratic Party side will be written off as regional affection for the senator from nearby Vermont – the campaign then moves southward for an extended period of time. That will benefit Hillary Clinton, and it will benefit Ted Cruz. And what of Rubio? He is hammering away at the theme that only he can unite the Republican Party – which is code for reminding the Republican Party about why it hates Cruz, given his repeated willingness to attack and exploit his colleagues on every issue since 2012. By his actions and by choice, Cruz is an lone wolf outsider in the party that he aims to lead. Part of his electoral appeal is that he has been willing to run against a Republican mainstream that he is gambling will be left with no alternative. Yet as of yesterday , there is now a viable option : Marco Rubio. And if Rubio can stay within a reasonable 5 point distance of Cruz during these early weeks, it could become a long and lonely run for Cruz all the way to the Republican convention. Hard not to cheer at the prospect of these guys tearing each other apart. Remember when right-wingers knew how to sing from the same songbook ? For the past five years at least, Dylan Sharp, Carrie Keith and their band Gun Outfit have been releasing knotty, semi-depressive songs imbued with a sense of disorientation. (Put it down to what the empty spaces of the Pacific Northwest can do to you.) This track from their late 2015 album Dream All Over has been my single of the summer. It has a pretty, ominous, hell bound glide that’s somewhat akin to the quieter moments of the late, lamented Gun Club. In some quarters, there is no higher praise. Race card in desperation is right, Key and other well placed (well compensated) traitors, (‘partners’ ) setting up for some radicalized displays of “Maori protest”. What Maori in there right mind would accept the word of a known liar( Key) and then invite him to Waitangi -something here stinks. No constitution ,no legal or lawful right to govern we have no democracy. With non disclosure to the people of NZ ( effected party)before negotiations ended there is no consent for the TPPA. There you go again with the allegations that the Government has no right to govern. On what basis do you make your point Anabel? Is it because you personally did not vote for National & therefore because it does not have your divine approval it lacks legitimacy? You should read an introductory textbook on constitutional and administrative law. There are some extremely simple concepts you need to get your head around before you start trying to engage in debate that’s beyond your capabilities. The problem isn’t ISDS per se. It is true to say we have always had them in one form or another. The difference this time is we are now allowing foreign corporations to sue the Government for the loss of expected future profits. This is a provision that never featured in agreements before and is the true problem with this agreement. What proof do you have that this govt has a right to govern in NZ? Guess you were so busy reading books recommended for system slaves “British Crown’s legal system books for infants vol 9-11″ that you never looked up to notice that we do not have a constitution in NZ. ” governing” of NZ by the British Crown in 2016 with no mandate is defined as: ignoring the will of the people, denying the people of the human right of needed health care by imposing Crown bankster austerity cuts while at the same time providing system stooges with bonuses and unfair pay increases. Is your idea on “governing” confused with bankster oppression and giving out unfair obscene corporate subsidies using the people of NZ as debt slaves . Recent Polls on the TPP conducted by major pollsters. “For some time now, Sharon Murdoch has been the best and sharpest political cartoonist in the country.” Yep, absolutely. Reminds me of her former partner, Trace Hodgson in his 1980s heyday. Razor-sharp. I don’t know why you seem so gleeful about the prospect of Rubio having any chance at the Repub candidacy. I find the prospect terrifying. He ticks many of the same narrative boxes as Obama (especially if, as may now happen, he sneaks up on the nomination out of nowhere) and is the only candidate with a decent chance of beating Hillary and Bernie. A very good chance, actually, given that no one really seems to like Clinton and Sanders is such a radical option (for the US at least). @ Dylan Its terrifying that people haven’t worked out yet that all the political candidates are selected by the corporation. The information/publicity on them is presented to the people by the corporate media. Clinton has been already been pre selected as the next president of the corporation of the usa by and for the banking cabal that loans your nation money with interest and imposes its policies. @ Anabel right on! Steve sounds like the typical arrogant govt employee who can only repeat what he is told by the Crown govt. Gordon Campbell scoffed at projections the China FTA would increase exports by as much as $300m a year, and told us it would be of little benefit to New Zealand. Since the signing, exports to China have grown by $8000 million – 26 times more than that – and equal to 80 years growth at the pre 2008 rate. Despite being about as wrong as it’s possible to be about our last trade agreement, endless fearmongering and doomsaying makes it look like he’s determined to be even MORE wrong about our next trade agreement. Maybe America is not the only nation full of gullible ignorant people. I must add I didn’t mean to link the global corporation’s TPPA to America . I don’t wish to sound like Peters ” The govt’s racism brew stirring muppet “. These foreign global mega corporations drafting and forming the TPPA/global govt to push their agenda and interests ( profits and control of resources)are foreign e.g China buying Syngenta for $43B. The American people didn’t get disclosure or get heard on the TPPA either. For those criticizing the protesting of the TPPA aka Key signing a corporate partnership(TPPA) that was not and is not fully disclosed when the people of NZ are the effected party is a valid protest. The non disclosure (then signing) of the TPPA is what is being protested (especially valid protest if as they claim 9/10 of kiwi’s admit ignorance that still don’t even know what the corporate partnership agreement document contains). Lucky for us it is this non disclosure in an agreement that invalidates it. Shame the lawyers working the controlled opposition were all corporate sell outs. New Zealand does have a constitution, it just does not have a supreme constitution that limits Parliament (save as for some entrenched provisions in the Electoral Act 1993). The National-led Government was formed consistently with constitutional conventions after gaining mandate through a robust electoral process. What proof do you have that New Zealand is governed by the British Crown? It’s nonsense. New Zealand does not have a written constitution. The right of foreign interests to govern NZ is not provided anywhere by the electoral act 1993. There is no right of this govt to govern. Of course you couldn’t provide proof what does not exist. You do not even know that the citizens of NZ are ruled by the Crown “subjects”. Wow just wow! The electoral process is unfair, the unverified votes are counted by the Crown, and the electoral process also creates media bias. There is no proof in existence that the Crown’s govt (& Crown entities it has created such as ACC, HDC, msd, privacy commissioner and the Ombudsman) has the lawful OR legal right to govern the people of NZ. The Crown dictates (Steve’s definition of “governs”) not by lawful right or constitutional legal document, but by keeping the people of NZ divided, distracted and ignorant. I’m not sure how you have formed your views on these matters but they are wrong. 1) New Zealand’s constitution is not written in a single source of law (although it is largely brought together in the Constitution Act 1986). It exists as a collection of conventions (such as Parliamentary Supremacy, separation of powers, ministerial responsibility, royal prerogative…), constitutional statutes (such as the Magna Carta, the Electoral Act, the Bill of Rights 1688 etc), and historical evolution and circumstance (the Treaty of Waitangi, the Acts of Devolution, the Statute of Westminster, letters patent 1981 etc). 2) This Government gained legitimacy to govern through the most recent general election and thirough its ability to maintain confidence and supply in Parliament. Elections can be scrutinized in the Courts, and can be proved. Elections are binding because of New Zealand’s constitutional system (see point 1). 3) The Crown refers to the Government. The Crown does not mean the Queen personally. Constitutional convention and practice and letters patents dictate that the Queen in Right of New Zealand exercises all power on the advice of the Government, and gives consent to all statutes supported by a majority in Parliament. 4) The electoral process is subject to an enormous amount of scrutiny from all political parties in NZ, by international electoral observers, by the judiciary, and by the Electoral Commission. I suggest you personally become involved in some role or function described above if you are concerned about electoral integrity. I suggest you become a scrutineer for the ALCP or such other party of your choosing. 5) You will find that Crown entities are established by their own statutes or consistently with the Crown Entities Act. They are empowered to make secondary regulation in some cases, and can bring prosecutions etc. All Crown Entities are bound to observe the law (i.e. they cannot override Acts of Parliament for they are not above the law). They are accountable through the judiciary, the Office of the Ombudsman, the Auditor General, their Ministers responsible and so on. See you can still provide no proof. You can name no written constitution that provides the govt with the right to govern NZ. ” the Constitution Act 1986″ obviously did not provide the right for the Crown to govern the people of NZ .”Letters patent 1981 etc” no that does not provide the right to govern people of NZ hahaha you are just throwing distractions from the lack of proof of the lawful and legal right of the Crown govt to govern NZ. The govt is actually illegitimate. The Crown’s ” farcical electoral process” is unfair, the media creates bias, the Crown counts the votes and Crown employees oversee it. Its nothing but a Crown electoral monopoly . The Ombudsman is a Crown entity, it is clear the ombudsman has never been held accountable. As for the Crown ministers OMG accountable ? You can’t be serious! The Crown is not the Queen you agreed, yet signatory Governor Hobson allegedly signed an agreement on behalf of the Crown ( whom you say is the govt of NZ) not the Queen. That is not true as the govt(NZ Crown) was not legally or lawfully formed at the time of the signing of the treaty. Something else to ponder with all signatories on the “agreement” dead who are the parties in the treaty. You are truly a retard. The type of person who can only see evil wherever you look. Seriously, stop smoking grass & get yourself an education. The British Government empowered NSW to extend its sovereignty over NZ through negotiating a treaty of cession with Maori. The Treaty (albiet floored) was signed. The British Government from that point gained legitimacy to govern NZ & did so through NSW. Through the establishment of British governance in NZ. NZ was first administered by a colonial Government appointed by the British Government & all subjects in New Zealand at that time were British subjects. In 1852 the British Government consented (after being lobbied) the establishment of a dominion Parliament with an internal electoral process specifically for NZ. NZ’s Parliament took up full sovereignty from the British Government through several statutes, the most significant of which was the Statute of Westminster 1947. The Constitution Act 1986 is simply an affirmation of existing constitutional laws which as a sum contribute to New Zealand’s system of governance and sovereignty. It was intended to make our constitutional structure simpler to understand for morons like you. Accountability. Ministers are held to account frequently for decisions they make that are contrary to law, convention or justice. For example, recently the Minister for Education Hekia Parata was held to account in a judicial review for her failure to undertake proper consultation with the Board of Trustees of Phillipstown School in making her decision to merge the school. If you are willing to look, and if you have the most basic research abilities, you will be able to find further such decisions (you might’ve even heard of Fitzgerald v Muldoon for example). Fallen to name calling as you have provided no proof of the Crown’s lawful and legal right to govern the people of NZ. The treaty did not provide legal or lawful right for the Crown to govern the people of NZ. You don’t even seem to know who the parties(they are all dead) to the treaty( invalid contract) are today. Though invalid the Crown still use the Queen’s Governer Hobson’s signature on behalf of the Queen for the Crown (not the Queen) to govern NZ. The British govt did not have the lawful or legal right to “empower NSW Australia” to extend its power to govern NZ through the invalid treaty with the Queen -that is just nuts mate. Its nonsense,saying the British govt “empowered NSW” has nothing to do with NZ and that certainly does not give the Crown govt the lawful right to govern the people of NZ. There is no written constitution in NZ. The Crown’s legislation does not provide it with a lawful or legal right to govern the people of NZ. The constitution act 1986 obviously does not grant the lawful right to govern or form a government as the Crown govt was already illegally and unlawfully governing NZ at the time it brought in foreign legislation and started passing its own legislation without the consent of the people of NZ or mandate. There is no document that you can point to that shows the people of NZ giving consent to the Crown governing them. We can all see the Crown govt ministers are not held accountable (Minster Parata was not held accountable). If you want to experience a state like the one you describe, I’d suggest making the move to Somalia. In fact I’d recommend it for you! You’d last a split-second. Feeble.I haven’t described any state and I was not discussing NSW or Somalia. I pointed out that the Crown govt has no legal or lawful right to govern the people of NZ. As as there is no existing proof of the Crown govts legitimacy you fail to provide anything but more nonsense. This time your “argument” consists of your suggestion that I move to Somalia and your belief I would not last a second. Actually, I have proved my point. The Government does have legitimacy in both theory and in practice. You haven’t proved your ignorant point at all. Where’s your evidence? The Crown govt( and you) need to and should provide the people of NZ with legal and lawful evidence of the Crowns right to govern the people of NZ. The Crown has no legal or lawful mandate to govern the people of NZ , if this was your point I proved it. Your asying the “British govt empowered NSW to extend its sovereignty over NZ” !!??!! OMG how funny, but seriously it just doesn’t cut it (except to reinforce your total lack of proof). The treaty document does not provide any proof the Crown govt having the lawful or legal right to govern the people of NZ. It is signed by governor Hobson(dead party) on behalf of the (dead) Queen of England NOT the Crown!. Who are the parties in the contract. NZ has no written constitution.The Crowns 1986 constitutional act did not provide the Crown with the lawful or legal right to govern.The Crown cannot give itself the mandate to govern the people of NZ it has to come from the people of NZ. The Crown’s NZ govt is illegitimate and unlawful. That’s true Anabel, in law all signatories and parties in the treaty are dead so the Treaty/Contract is void. Its a bit of a gravy train for some and its the only thing the Crown has to trick people of NZ into believe the Crown ( and not the Queen who “signed” the treaty ) has the right to govern the people of NZ . I win, you lose, get over it. @ Helen its no surprise that ‘Steve’ (the brightest and best spokesperson for the Crown NZ govt with one of the highest levels of maturity ) could provide no proof of its legitimacy. The Crown’s NZ govt has no proof whatsoever of its lawful OR legal right to govern the people of NZ. The dirty little secret of the illegitimate Crown NZ govt . Its a bit mind boggling that there is no proof of lawful or legal right for the Crown’s NZ govt to govern the people of NZ. And shouldn’t the Crown have to provide the people with proof?! Some Maori are seeing the Crown NZ govt signing the TPPA “which will remove the treaty benefits” which only go to the select few. One day soon people of all races will see that the illegitimate Crown NZ govt serves only the interest of the Crown’s corporations. Its a bigger story than the exposed corruption of the Crown’s NZ govt. The TPPA will not ‘remove the Treaty benefits”. NZ as administrator of the TPPA will be meeting the undisclosed costs of administering the TPPA trust. Big foreign corporates drafted what they call a a “partnership” agreement for which even the administration costs have not been disclosed. An agreement that we did not agree to. Being that we are the effected party we were without disclosure( no contract)and clearly we did not provide the zionist bankster Key tool permission to sign. Much the same as the people of NZ did not ever give the Crown permission to form a govt in NZ . The PM of the illegitimate Crown NZ govt unlawfully signs the TPPA document in the name of the people of NZ .This bankster does this without the people of NZ having full disclosure even though they are the effected party. Bankster Key does this to make citizens of 12 nations finance the increased profits and control of the Crown and its corporations who drafted the TPPA. Keyster does not imagine the people of NZ will benefit from the TPPA from paying more corporate bailouts/subsidies/welfare/lawsuits while under his banking cabal master’s “austerity” program.